Access All Stipplr Actions Instantly Within Our Photoshop Plugin. • Made for both OS X and Windows platforms. • CS3 or earlier not compatible with the Stipplr panel. • Photoshop Elements not compatible. * Requires the Stipplr Plugin. The Stipplr INKER series of shape tracing actions attempts to enhance the natural contour lines found within your source photo. It then auto traces the results using Photoshop’s path tool to generate a vector shape which is then saved to a Smart Object on the layer above the source photo. 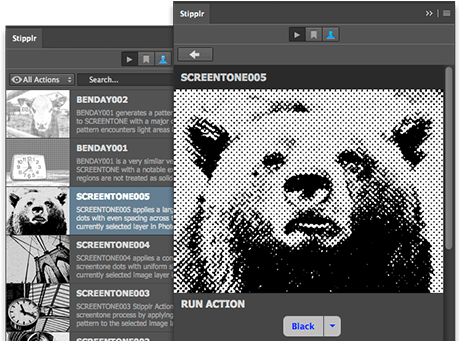 The Stipplr SCREENTONE and HALFTONE series generates a dot pattern which is then applied to the selected source photo in Photoshop. The pattern, in addition to some additional filter gallery effects, produces SCREENTONE or HALFTONE results which are then shape traced and saved as a vector shape inside a Smart Object on a new layer above your source photo. The Stipplr CARTOONBLAST is our most whimsical shape tracing series. The Cartoonblast series uses the data found in your selected photo to generate an explosion effect — using the same Stipplr Action across multiple photos will result in multiple unique explosions. Try all our Cartoonblast Actions for additional variations in style and combine your results in custom compositions! New to Stipplr is a Raster category, these Stipplr Actions generate results more typical of most Photoshop Actions, that is to say, a pixel-based result. The Watercolor Actions apply a series of layer and gallery filters to the selected source photo in order to generate a result very similar to a hand painted watercolor. How many shape trace actions are published each month? All the shape trace actions on this site were created prior to the site’s release making it difficult to put a number on new Actions per month. The focus of this site is actually centered around the tutorials which are writen to show users how flexible the actions are when composited together in unique arrangements. How are your shape trace actions different from other providers? To our knowledge there is no other site out there offering Adobe Shape Trace Actions. In Photoshop, vector shapes are created manually with the path tool. With Stipplr Shape Tracing Actions anyone can create these Adobe Shapes automatically by running a Stipplr trace action on any selected photo. Photoshop does not have any direct gui with which a designer can perform a shape trace process on an image layer, however, by manipulating some features within Photoshop and combining these into a repetative workflow Stipplr can simulate the essentials behind auto tracing. Stipplr was conceptualized in early-2014 and became functional Actions by mid-2014. During a period of 2 years the website and actions were only available internally to us as we continued adding more Actions, Tutorials and lots of testing. Where is my paid receipt? If you are a premium member, you can find your receipt under the “Print Receipt” link in your Paypal account. A similar receipt was also sent you you via email at the time of registration. For any other billing inquiry, please contact us directly using the contact form. After subscribing, how long will I wait to access the Actions? Access is instant. Once payment is complete, log into the profile section of the Stipplr Photoshop plugin and find the Action of your choice. What is the difference between the Year, Yearly and Monthly plans? Our $4 Per Month plan automatically renews every 30 days and is billed monthly — this allows anyone with short-term requirements to cancel within 30 days and only be charged $4. The $16 Per Year plan renews each year and is the most economical at only $1.35 per month average. Optionally, for those who do not want to commit to a renewal plan, the $24 For One Year plan is not renewed at the end of its term. Recurring payments can be cancelled at anytime! To cancel simply email us at support@stipplr.com requesting cancellation — yeah it’s lowtech but we fully intend to automate the process in the very near future! Is Paypal a requirement for premium membership? PayPal is our payment processor. Those who have a PayPal account can pay using their email while those without a PayPal account can purchase a 1 year plan which can be paid with any credit card. Do Ads appear for premium members? Ads will never appear in the Stipplr Photoshop panel when members are logged in, however, ads will continue to appear on stipplr.com. Premium members will not have to visit the website once the Stipplr panel is installed, all Actions will be streamed directly from the website to the panel ad free.